There was no doubt in Mike Kearney’s mind that Liverpool had taken the lead when Anfield erupted on Tuesday night, he just wasn’t sure who the scorer was. The lifelong Liverpool fan was born with sight problems and has been registered blind since he was seven years old. But while it was Mo Salah who slotted the ball past Napoli goalkeeper David Ospina to ultimately seal Liverpool’s passage to the Champions League knockout stages with a 1-0 win, it is Mike’s phone that hasn’t stopped since. 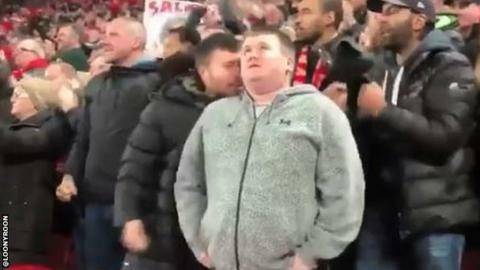 Nearly three million people have watched a clip on Twitter of his cousin Stephen leaning over to tell him who netted for the Reds, sending the pair’s touching exchange viral. The 26-year-old, a regular at Anfield, has a degenerative eye condition which has got worse as he has got older. “I wish I could see more but that doesn’t mean I can’t form an opinion of my own,” he said. Mike admits he has been surprised at the level of interest following the clip being posted, with Salah’s involvement meaning even media outlets in Egypt have got in touch. But it would have been easier for the Liverpudlian to distinguish the scorer had Salah’s strike not come at the Anfield Road end of the ground. Mike used to use the club’s live commentary service for blind and partially sighted spectators, but now prefers to immerse himself in the atmosphere. “It’s there if I really want it,” he said. “I like just being involved in the atmosphere and hearing what my cousin thinks – and anyone else, whether it’s five rows back and a pleasant comment or not.